PLYMOUTH Diving’s Aidan Heslop picked up a bronze medal on the fourth day of the European Junior Championships in Helsinki. He and his Great Britain diving partner Lucas Thomson claimed third place in the boys’ synchro platform final. Heslop’s success followed on from that of Plymouth team-mate Victoria Vincent, who won a silver in the girls’ three-metre synchro final and a bronze in the mixed team event. Heslop and Thomson, who had finished fifth and sixth at April’s Commonwealth Games competing for Wales and Scotland, took third place behind Russia’s Aleksandr Lebedev and Ruslan Ternovoi and Ukraine’s Yevhen Naumenko and Oleh Serbin. The Russian pair finished with an impressive 315.06 points from their five dives, with the Ukraine team collecting 281.94 and Heslop and Thomson 276.84. 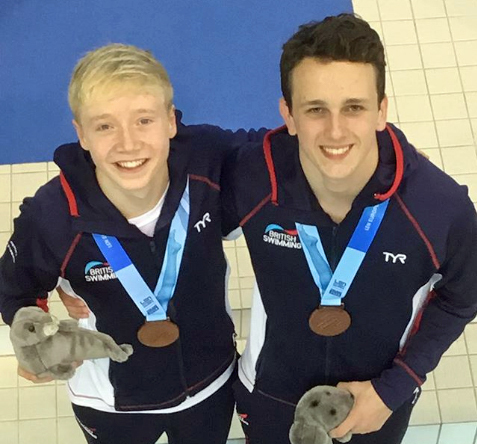 Both Heslop and Thomson will compete in the individual boys’ A platform event on Sunday.